SK Films Giant Screen film Flight of the Butterflies made its Toronto debut to a hometown crowd at the Ontario Science Centre. A VIP event was held with a number of dignitaries including Kathleen Wynn, Premier of Ontario and Ambassador Mauricio Toussaint of Mexico in attendance. With the support and participation from the Mexican Tourist Board, guests who attended the standing room only screening were treated afterwards to wonderful Latin-themed music, drinks and food. Live monarchs decorated the tables during the reception and guests were invited to learn more about the monarchs from expert Don Davis who provided live demonstrations on how to tag butterflies. 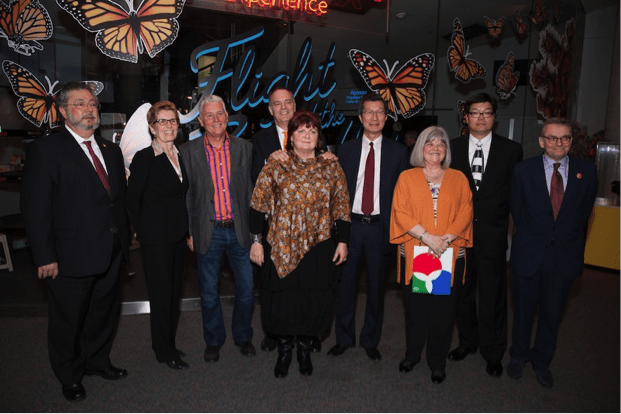 (L to R) Ambassador Mauricio Toussaint of Mexico, Kathleen Wynn, Premier of Ontario, Mike Slee, Director of Flight of the Butterflies, Jonathan Barker, Producer and SK Films CEO, Wendy MacKeigan, Executive VP SK Films and Co-Writer, Michael Chan, Minister of Tourism, Culture and Sport, Lesley Lewis, CEO Ontario Science Centre, Brian Chu, Ontario Science Centre, Chair, Board of Trustees, Hooley McLaughlin, OSC, VP Science Experience & Chief Science Officer.